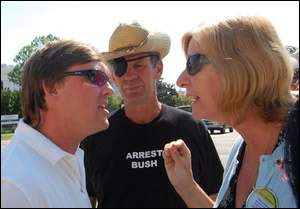 Operation Yellow Elephant: Now It's President Bush's Turn: Urge Chris Vucovich to Be A Man! Enlist! Now It's President Bush's Turn: Urge Chris Vucovich to Be A Man! Enlist! Chris Vucovich [above, left], prominent Republican in Montgomery, Alabama: "If George Bush said we need men right now I'll go." OK, President Bush, here's your chance to Save Iraq and Save America: Urge real Americans eligible to serve [healthy heterosexuals 41 and under] to support you by contacting military recruiters to Be A Man! Enlist! Hat tip to Wek, and here, and here. HELL, yes. I want chickenshit Vucovich on the next plane to Iraq. AND EVERYONE IN HIS FAMILY TOO! He is nothing more than a coward. He is something less than that. He claims this country needed defending, but he WONT fight for it. That makes him a traitor. There are homosexuals serving right now, that are proving to be more manly, more patriotic, and better americans than this fine example of republican bluster bravado and cowardice. Thanks Chris, for proving what I have been saying for quite some time. That while republicans think this war should be fought, they WONT fight it.